Some people think there’s no such thing as a bad mac and cheese. But I beg to differ. Like a lot. We’ve all had it happen to us: You’re craving mac and cheese something awful and have a nice beautiful plate full set in front of you. You take a bite and…. Nothing. It tastes like nothing. What’s the point in eating a plate of pasta covered in cheese if it doesn’t taste like anything? If you’re going to do it, you need to be doing it right. And that means lots of sharp flavorful cheese. And some garlic zing. And probably some sort of meat, like sausage. If you want to make yourself feel better about the whole thing, toss in some kale. Kale makes everything a well-rounded meal, right? Right??? No matter what you say, I will continue to believe so. I made this mac and cheese on a whim. Really, because I was craving roasted garlic and felt as though it would be too strange if I roasted a couple heads of garlic and ate them right out of the skin. No? Would it be OK to serve that as dinner one night? Because sometimes that’s really all I crave. But note that I went from craving a healthy clove or two of roasted garlic to making an entire decadent mac and cheese dish. The mind works in funny ways, doesn’t it? I don’t like to argue, so I usually just go with it. And then thank it later. Are you kale obsessed like I am? 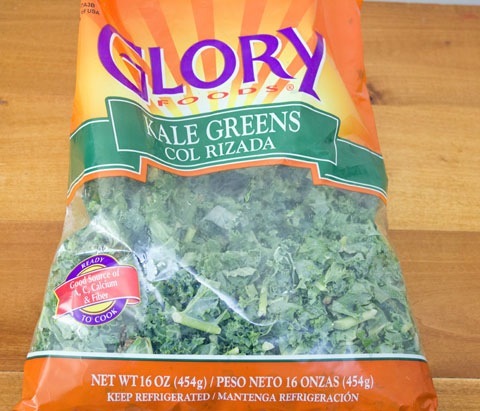 If so, kale in a bag will change your life. No more cleaning, drying, chopping. It’s already done for you. I know. I’m lazy and it’s silly, but whatever gets me to eat more greens, right? Or add them to my ridiculously bad for you mac and cheese. Anyway. Let’s start where all good love stories start. At the garlic. I learned a new trick this month from Simply Recipes and it involves a couple heads of garlic and a muffin tin. 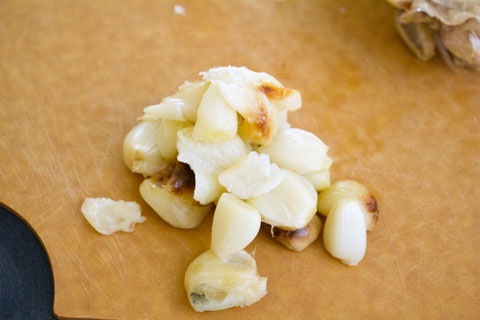 You’ll want to peel away the outer layers of garlic skin, making sure the cloves are still together. Then cut about 1/4 inch off the top, so the garlic cloves are exposed. 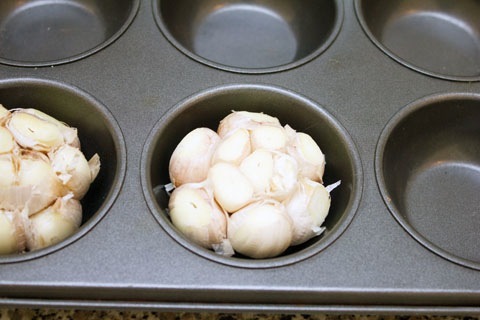 And place the heads of garlic in a muffin tin. Drizzle some olive oil over the top, making sure it’s rubbed into the cloves. 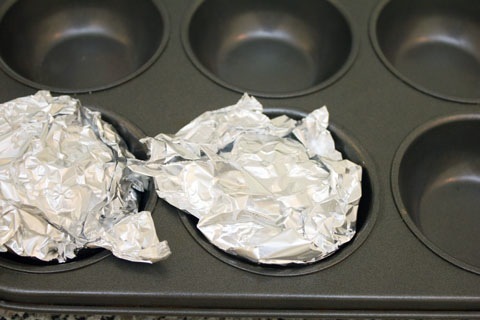 And then wrap the tops with aluminum foil. Bake at 400 degrees for 30-35 minutes, until the cloves get soft. And until your kitchen smells like a dream come true. Or a nightmare if you’re a vampire. Guess it depends on who you ask. Once the garlic has cooled enough that you can touch it, pull the cloves out of the skin. 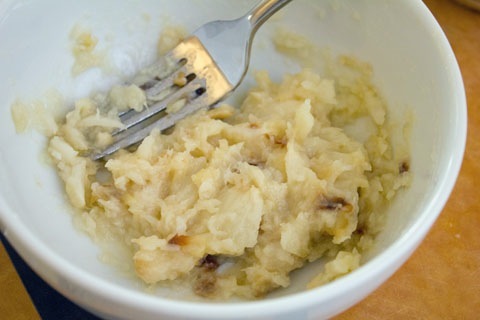 Then, put them in a bowl and mash them with a fork. Set aside. This will come in handy later on. 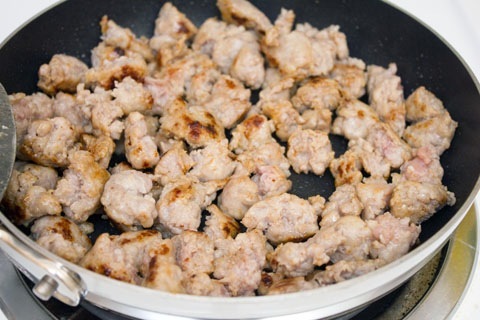 In a medium frying pan, cook sausage until cooked through. I used 6 links of sausage, which was about a pound. But it was kind of a lot and I think 4 links would have been better. Bring a large pot of salted water to a boil. Add pasta and boil until al dente. Drain pasta and return to pot. 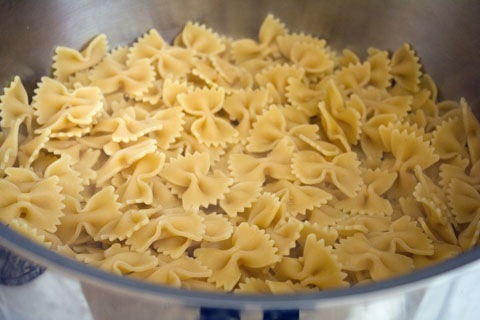 While the pasta is boiling, melt butter in a large sauce pan over medium heat. Once melted, pour 2 T into a small bowl and set aside (this will be for the panko topping). 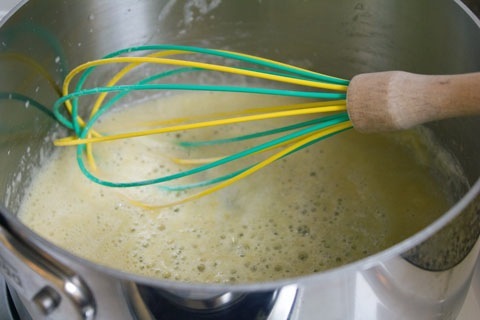 Add flour and mustard powder to the melted butter in the pot and whisk for a minute, without letting the flour darken. 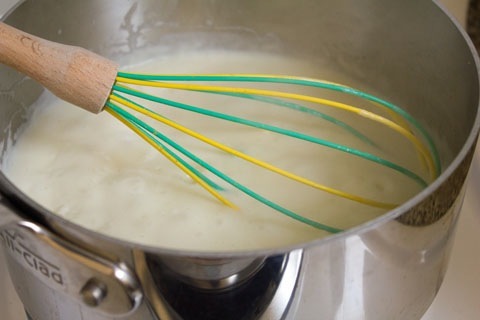 Then whisk in milk and bring the mixture to a boil, before reducing heat to medium-low and letting simmer for 2-3 minutes while sauce thickens. Remove the pan from the heat and whisk in the cheeses and all of that delightful smashed roused garlic. Sprinkle with salt and pepper. 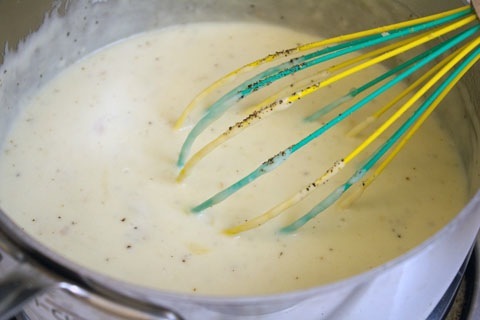 Pour cheese sauce over cooked pasta in pot. 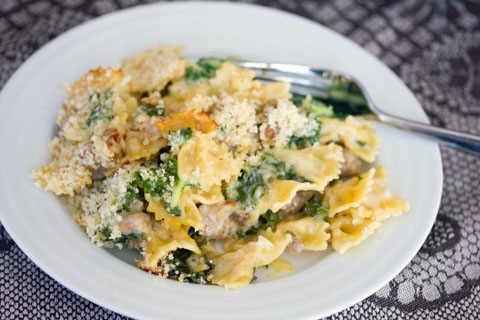 Mix in sausage and kale. 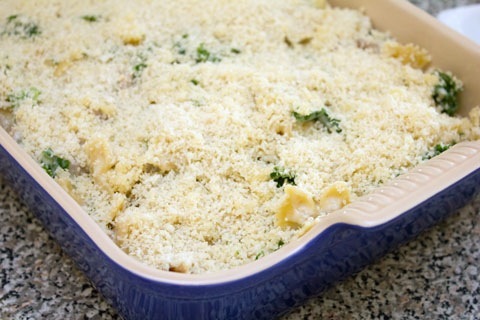 Put pasta mixture into a baking dish. Mix the 2 T reserved butter and panko together and evenly sprinkle over mac and cheese. Put in the oven at 400 degrees for about 15-20 minutes, until the panko starts browning and crisping up. Serve yourself a nice, generous portion. The bigger the serving, the more kale you’re consuming. Think of it like that. I recommend serving this with a large glass of heart-healthy red wine. You know, for the extra health benefits. WineEnthusiast.com sent me the awesome Fusion Whirl Glasses you see in the photos and I’m loving them. They’re designed to allow for an “aggressive swirl,” which is pretty much the best thing ever. Some day when I have a wine cellar in my house, I’m also going to have a billion different wine glasses for every kind of wine. But I’ll probably still only drink from one. One that lets me get an “aggressive swirl” would be ideal. I’m not going to lie and pretend this meal is healthy. That would be unethical of me. But I will promise you that it is delicious. It’s not one of those disappointing mac and cheeses. Not even close. The roasted garlic is powerful, but really not as powerful as you might assume considering there are two heads of roasted garlic in the dish. The cheeses are sharp and flavorful and the sausage adds a whole different level of deliciousness. I actually felt like there was almost a little too much sausage and next time I might go with only 4 links. I know. Too much sausage are words you never thought you’d hear. And let’s not forget the kale. I mean. 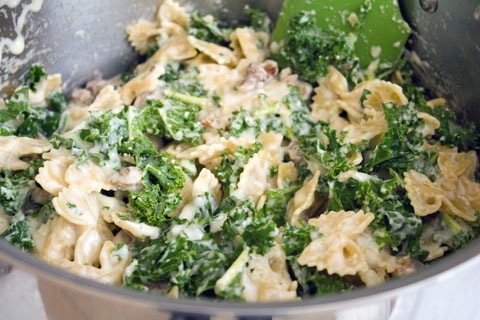 If you like kale, you’ll love the extra bitter bite the kale leant to the mac and cheese. 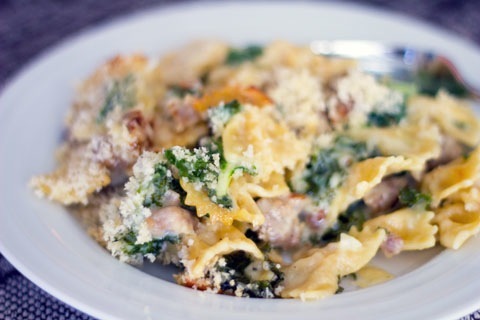 If you don’t like kale, well, then, you could always use spinach instead. Or simply leave the greens out and stop pretending this has any nutritional value. I won’t blame you. My favorite thing about this mac and cheese? It obviously made a ridiculous amount, which meant I was set for lunch for the next several days. And nothing makes it easier to get through a rough morning at work than knowing this is waiting for me in my lunch bag. I was actually sad when the dish was finally empty. But that just means I’ll have to make it again soon. Tough life, huh? What’s your dream mac and cheese? 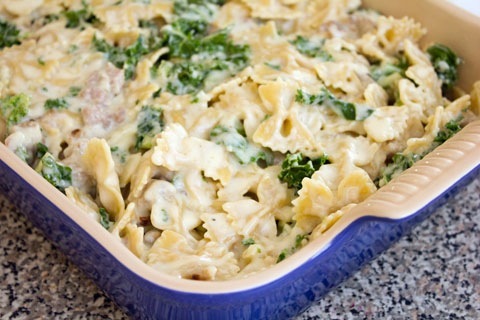 24 Responses to "Roasted Garlic Mac and Cheese with Sausage and Kale"
The more garlic the merrier! And kale totally makes this healthy! Looks great, thanks for sharing! I love getting creative with kale. I had an awesome smoked gouda and lobster mac and cheese at Harvest a few weeks ago. I’ve been craving mac and cheese ever since! 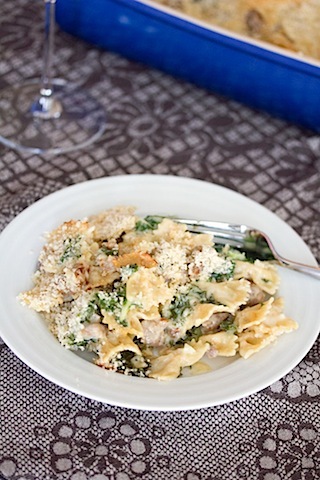 What’s not to like about mac and cheese with sharp cheese and sausage and okay fine, kale too! I could make this last way fewer than 10 servings ha! Sues, i think if i lived closer to you, we would have to have potlucks to share the love on all these beautiful creations. I too love a good mac and cheese. A local spot in brooklyn makes a sick mac and cheese with slab bacon, gruyere cheese and a white cheddar bechamel. Its so delicious its sickening. i think i would totally eat roasted garlic spread on some toasts for dinner 🙂 but this sounds equally delicious!! Yum! I have a theory that if I eat kale I am basically the healthiest, most amazing person in the world. 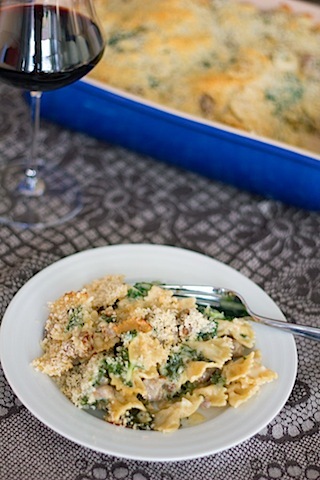 Therefore, mac and cheese + kale = a-ok in my book! Uhm, roasted garlic is the most amazing thing ever and it is definitely acceptable to eat an entire head straight from the skin. This pasta sounds yummy! ugh, just seeing that picture of the garlic makes me want this!!! 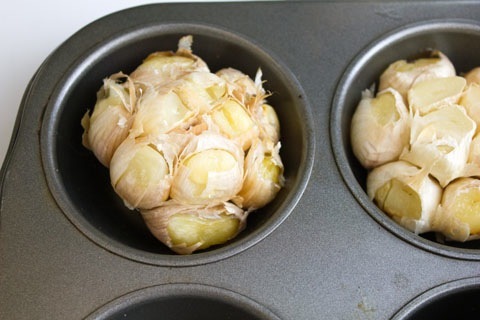 LOVE the roasted garlic idea. YUM. Roasted garlic spread on bread definitely constitutes dinner. 🙂 This is a great idea too. I usually like to add tomatoes to mac and cheese, which would work well with this combo! Every mac n cheese is my dream mac n cheese 🙂 This one does top the list! Oh, I’ve totally had bad mac & cheese. 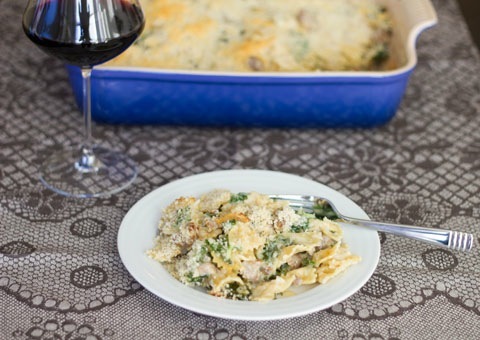 In fact, I’ve made it myself (a very bad bacon mac & cheese fail several years ago…) This looks awesome though, and I love the idea of adding sausage! Lots and lots of flavors in your mac and cheese! 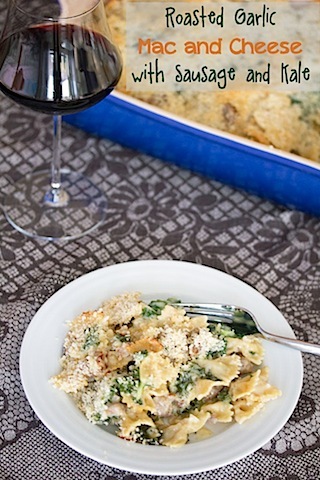 Super idea to use gruyere, too. Yes please! This is a pregnant lady’s dream meal. So delicious! I HAD to make this last night. I used Havarti and sharp white Cheddar. The boyfriend said it was the best mac n cheese he’s had. I LOAD my mac and cheese with garlic because I hate the flavorless disaster that can happen. I LOVE this. 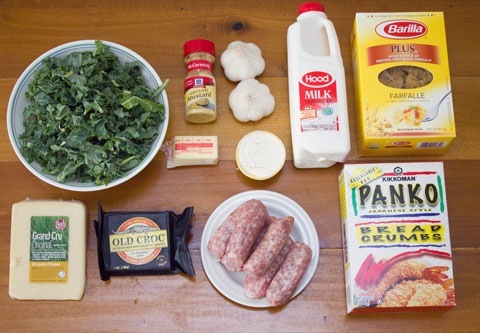 Kale and sausage FTW. oh man. i need to try this! roasted garlic is FAB!! agree! There is definitely bad mac and cheese! Roasted garlic? That sounds like an amazing add in. Gah! Want! 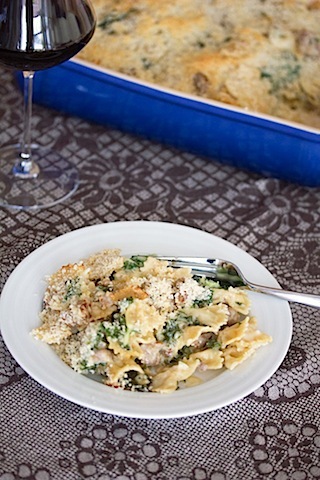 Roasted garlic and kale sounds and looks fabulous in this mac and cheese…yum! this looks amazing. I love that you put roasted garlic in there! I add some taco seasoning, pepperjack cheese, peppers, and anything else that I have around for southwestern mac & cheese!